Confession time: I was a planning disaster for most of my life. Anyone who knew me as a child/teen/young adult knew my environment was a disaster; I waited until the last minute to prepare for everything, and procrastination was the rule, not the exception. I studied in the car on the way to an exam in college… while driving. My friends who were born organized would often clean the disaster that was my bedroom during sleep overs. I couldn’t find anything when I needed it. My life spiraled based on how disorganized everything was. I was out of control in my environment, and it had a direct effect on my mind. It took me about 30 years to make that connection. There was a time in my life where I experienced panic so bad that I didn’t want to go to work or leave the house. I had a medical condition related to my thyroid and I was seriously losing my mind. At the same time that I was being medically treated for the thyroid condition, I looked around me. It was no wonder I felt out of control. Everything around me was out of control. I knew I had to make a conscientious effort to change. I started researching what other people did to be organized. I started making lists. To do lists. Shopping lists. Cleaning lists. I started using the tools that were available. There are hundreds, maybe even thousands of websites devoted to this very thing. Flylady was one of the first places I started. 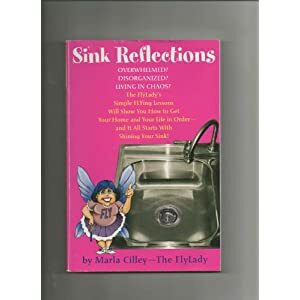 I got her book “Sink Reflections” and started working on routines. I created a “control journal”. I learned about how clutter=cluttered mind. I learned *how* to clean. I learned that “half-assed” clean was better than filthy. That being perfect wasn’t as important as trying. Not all of her suggestions and routines fit my life and I had to discover my own path, but to this day, I still zone clean right along with her. Finding your own plan is the most important thing. Try new things. Try new lists, new forms, new planners. The internet is FULL of them; pretty ones, smart ones, why-would-anyone-want-to-plan-for-that?-ones. It’s up to you to find them. Along the way, I’ll share which ones work for me, or new ones that I find. Just try something. I guarantee that you’ll feel better once you feel in control. Enjoy the journey!